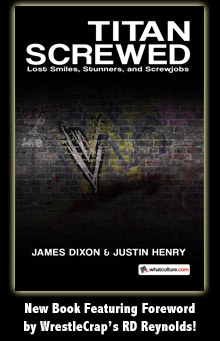 Someone Bought This Classic: Rubber Damien - WrestleCrap - The Very Worst of Pro Wrestling! Thanks to Hasbro (maker of the little plastic WWF figures we all know, love and collect), now you and your friends can recreate the historic moment when Earthquake gave a Quake Splash to Jake the Snake’s pal Damian. But rubber burgers don’t taste so good in an Easy Bake Oven, pleh! 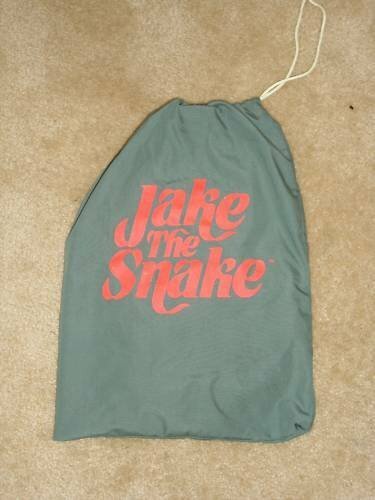 The rubbery reptile even comes with his own drawstring bag that says “Jake The Snake”. Good thing, too – we wouldn’t want anyone buying a fake or forgery of this! 12 Responses to "Someone Bought This Classic: Rubber Damien"
When I heard the name “Damien” in Wrestlecrap, first thing I thought was a rubber action figure of Damien Demento. I was wrong. Wow. Funny thing is I used to have this when I was a kid. After I was done playing with toys and my mom put everything in storage, she got scared terribly one day when she was in our storage building, saw the rubber snake laying in the floor and thought it was a real snake. A little off topic, but I used to have a Hulk Hogan dress-up kit when I was a kid too, complete with head band, wrist bands, and a Hulk Rules shirt. Yeah, I got beat up a lot. HAHA… I had one of these. I totally had this. My Grandparents bought it for me. i had this also, i remember i threw it on my uncle when he was sleeping and almost gave him a heart attack. I have a rubber Damien! Complete with the original cardboard package box. I’m not even gonna lie- I’m jealous. Legit one of the coolest pieces of wrestling merchandise I’ve ever seen. HUGE fan of Jake “The Snake” Roberts to this day. They pop up on eBay from time to time. Kid: A rubber Damien Snake? Dad: No it’s five pounds of Veal. 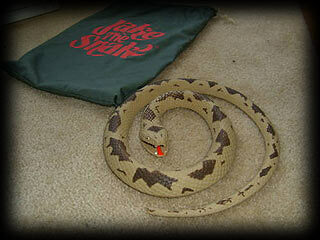 Dad: Then go out and get a job and buy a rubber Damien Snake!